Ahhhh....homemade chicken noodle soup. So good and so good for you. It's cold in LA right now (I can see all of you folks elsewhere rolling your eyes), but is just what the dr. ordered (or, uh, this doctor). I'm tickled with delight that I've finally found my go-to recipe! It's chock full of fresh herbs and it's got a secret twist to it Trust me here. You won't be disappointed. Great tip from friend Stephanie whose husband is out-of-country for work. She makes a pot of homemade chicken soup with lots of veggies, and she and her kids eat it all week. An easy way to get multiple healthy meals during a busy week! *You can add other veggies like winter squash, zucchini, peas. I love to add frozen peas at the end. In a large saucepan or Dutch oven, combine broth, salt, bay leaf, poultry seasoning. Add the whole chicken in the pot (the secret for a tasty broth!!). Bring to a boil. Stir in celery, onion, carrots plus other veggies. Reduce heat, cover, and simmer 15 minutes. Remove chicken. In a small bowl, mix cornstarch and water together until cornstarch is completely dissolved. Gradually add to soup, stirring constantly. Stir in noodles, chicken, fresh herbs and heat through. Cold-ish winter days ahead mean it’s time to fire up a pot of soup. Ahhhh….there’s nothing that warms the heart like the smell of a delicious soup wafting through the house on a dreary day. 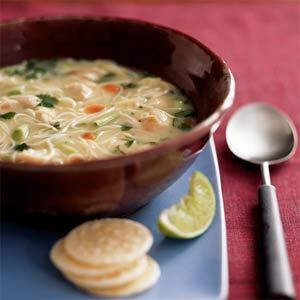 And soups are a great way to get kids to eat their veggies. We recently dined at Hatfield's, which is A-MAZING!! They served us a small bowl of cauliflower soup as an amuse bouche (in layman's terms it means a little something to tickle your fancy before you begin a meal, you know the little freebie from the chef). My hubbie and I were determined to make soup like this. And that's how I got here...this recipe is really my take on the classic Joy of Cooking “Cream of Cauliflower Soup.” This is pretty easy recipe and a crowd pleaser to boot. So, grab a pot and get cookin’, and soon you’ll have a mug of homemade cauliflower soup in your hands. And your heart will thank you! 1. Heat a ¼ cup of chicken broth (water can be used, too) and butter until butter is melted. 2. Cook onion and garlic until tender. 4. Puree cauliflower and potatoes in a Cuisinart or with an immersion blender until smooth. Add back to the pot. 5. Stir in milk and salt. Add more salt and pepper to taste. 6. Simmer for a few minutes and then serve with a little fresh dill and grated cheddar cheese on top. Next time, try this with broccoli instead of cauliflower. Oh, the excitement of Thanksgiving week is upon us and the menu planning is in full swing. This will be our first year to be sans family and cook a turkey on our own. We'll be dining with friends, and hopefully, they'll enjoy all of our experimentation. After reviewing what the expert chef's orchestrate for their Thanksgiving feasts, I've noticed a certain trend.....offering a seasonal squash or pumpkin soup as a starter. So in that spirit, we're planning to make this yummy Southwestern Pumpkin soup. We've made it before a few times, and it doesn't disappoint. We add a touch of ground chipoltle peppers as the smokiness goes well with the sweetness of the pumpkin. You can add a dollup of non-fat yogurt or sour cream, too. I'll keep you posted on the other Thanksgiving menu items. I love a good, hearty chili. I also love a lighter version of this classic Southwestern comfort food. Here's one of our favorite chilis adapted from a recipe on AllRecipes.com. Since it is fall and prime football season, I thought I'd pass this one along. You may want to double the recipe. It's gone fast like that wide open receiver. Original recipe yields 8-10 servings. That's smallish servings like maybe for 8 - 10 kids. Or we are just outright pigs. 1. Heat oil, and cook onion and garlic until soft. 2. Stir in broth, green sauce, tomatoes, chilies, little beer (optional) and spices. Bring to a boil, then simmer for 10 minutes. 3. Add corn, chicken, and beans; simmer 5 minutes. Season with salt and pepper to taste. 4. Serve with these toppings for people to choose from: limes, cilantro, Monterrey Jack cheese, avocado, sliced fresh jalepenos, sour cream or non-fat yogurt, and tortilla chips. We also like to serve this over ready-made polenta (look for it at the grocery store / we get our at Trader Joe's). You can microwave the polenta first, and then spoon the chili on top. Or you can slice the polenta and crisp it up on the skillet. Last March, we invited friends over to watch the Final Four and served this chili to our friends and their kids. Perfect for that game-watching party! I was reminded of this recipe over the past week after a bout of the stomach bug. When dealing with a tender tummy, I tend to use more ginger (known for its tummy soothing power) and less spice. When the next common cold raises its ugly head in your house, give this recipe a try and let me know what you think. In a medium saucepan over high heat, combine the chicken broth, lemongrass and ginger; heat to boiling. Reduce heat to low and simmer 15 minutes. Remove the ginger (if you used whole ginger). Add the noodles and mushrooms and cook until softened, 2 to 3 minutes. Add chicken if desired. Add the scallions and remove from heat. Divide the noodles and broth among four bowls. Top with the bean sprouts, herbs. If desired, squeeze a little lime. Add a touch of sriracha and/or hoisin sauce. The great thing about this soup is that you can really make it your own. Add frozen shrimp instead of chicken, or thinly sliced flank steak. Also, you can add frozen dumplings (I get them from TJ's) for wonton soup (follow instructions on the bag for how long to cook the dumplings). Of course, you could always get takeout from the multitude of Pho restaurants in LA such as Pho Cafe, Pho 97 Restaurant, Pho Pasteur, Pho 79, Golden Deli Vietnamese.